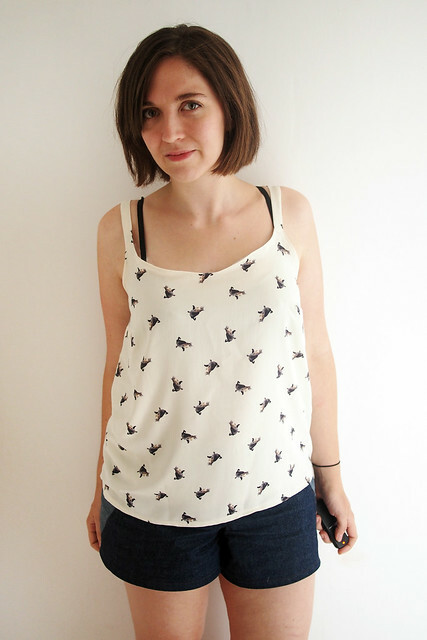 Just a quick one today to show this tee I made as part of a White Tree Fabrics blogger challenge. 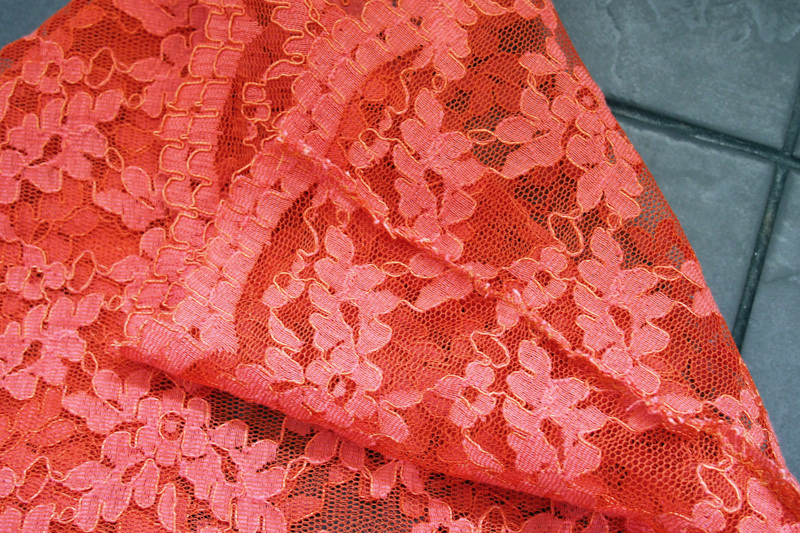 They invited their blogger network to pick a lace fabric to celebrate this week’s lace-themed episode of the Great British Sewing Bee – I still haven’t seen the episode so no spoilers please, but I hear someone on the show used this very same fabric for their dress! 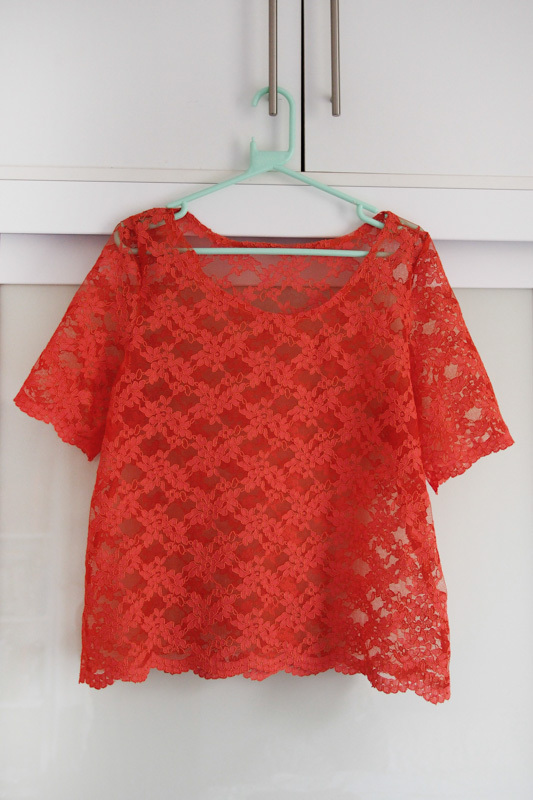 I went for a Burnt Orange corded lace because the colour is so beautiful and, being quite inexperienced in sewing lace, I thought a more rigid lace would be easier to deal with. It’s not quite as neon as it came out in these photos by the way! 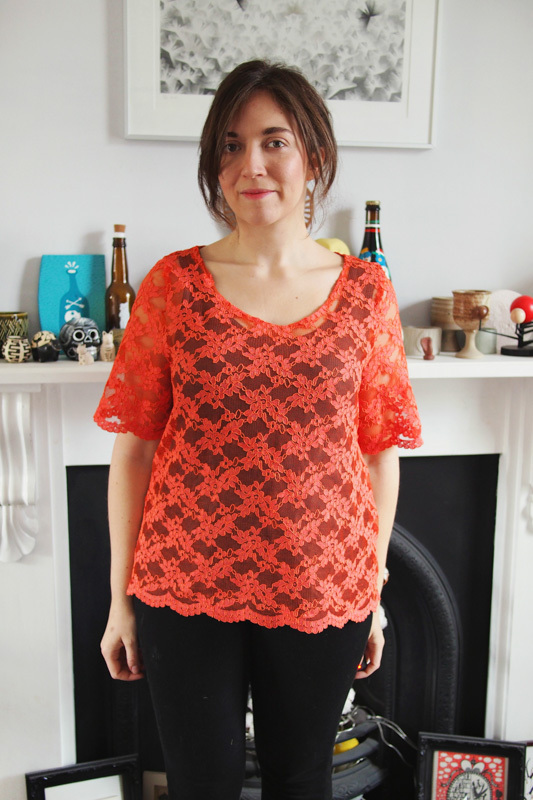 To show off the lace I picked a simple T-shirt pattern – the Salme pleated t-shirt. I did plan to add the pleats initially, but decided against it in the end as I wanted the lace pattern to be the star of the show. 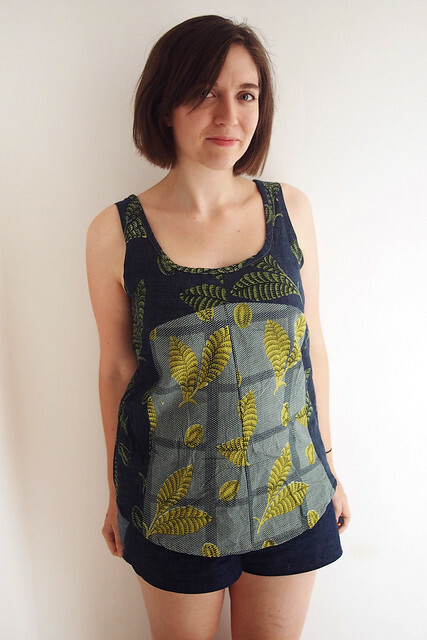 I made sure to line up the bodice and sleeve hems against the selvedge to be able to use the scallops for the edges. I cut the seam allowances down to about 5mm and finished the raw edges together with a small zig zag (the fabric barely frays at all anyway). 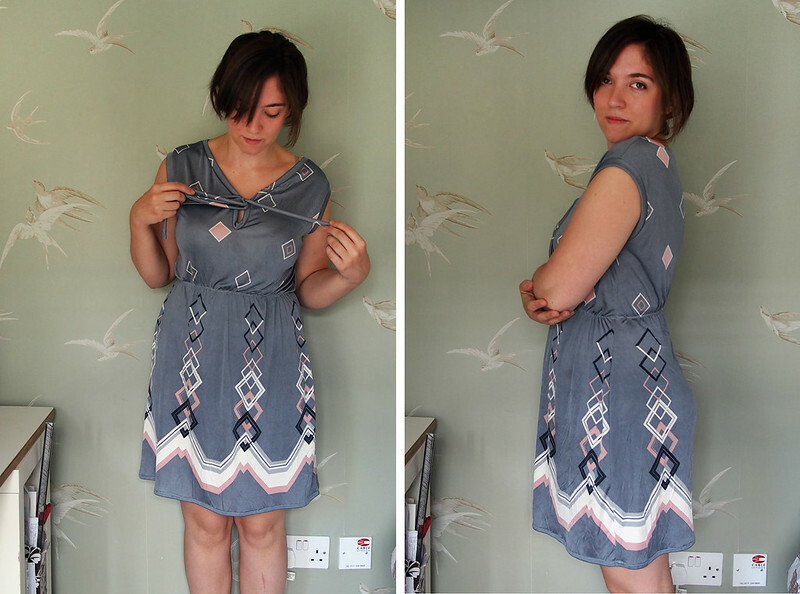 The neckline is simply turned and hemmed and there was no hemming required on the cuffs and bottom hem, making this a very speedy sew. 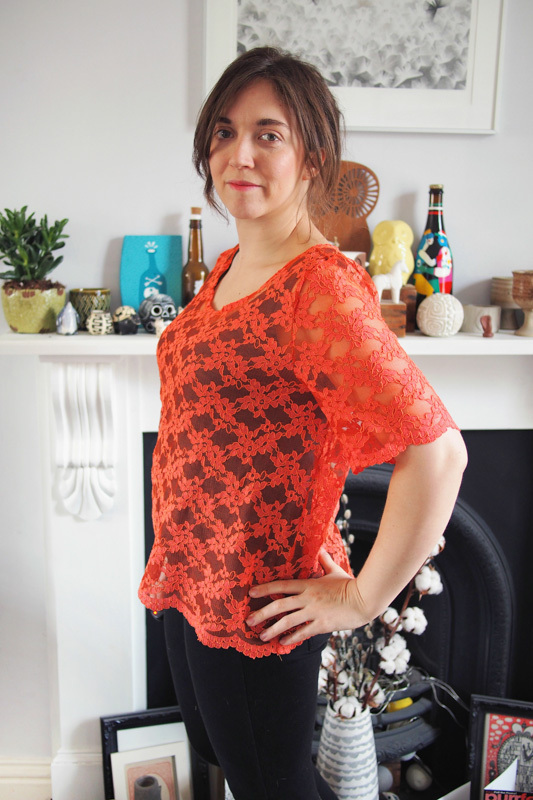 Pop over to the White Tree blog to read a bit more and see the other bloggers’ lacy makes. Tomorrow I’ve got a review of the new GBSB book coming too! I’ve been a bit stuck on what to make next since the new year. I keep looking between my fabric stash and sewing sketchbook, sighing and dithering. 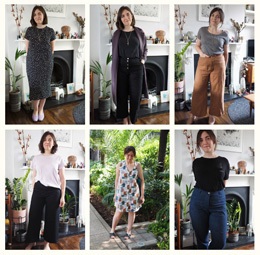 It’s a bit of a battle between picking projects that I find challenging and interesting to sew, and what I actually like to wear. 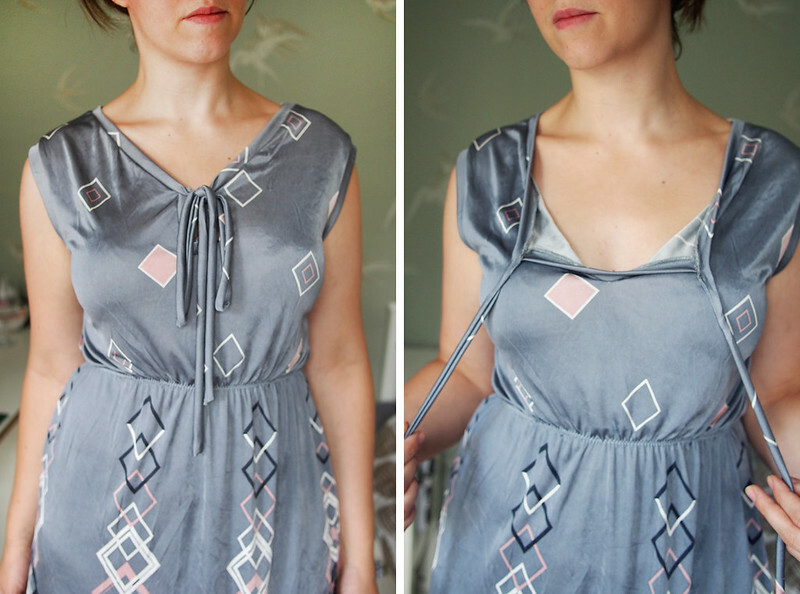 Those two criteria often seem diametrically opposed unfortunately, as I’m constantly seeking new sewing challenges, but basically live in simple shapes and fabrics. 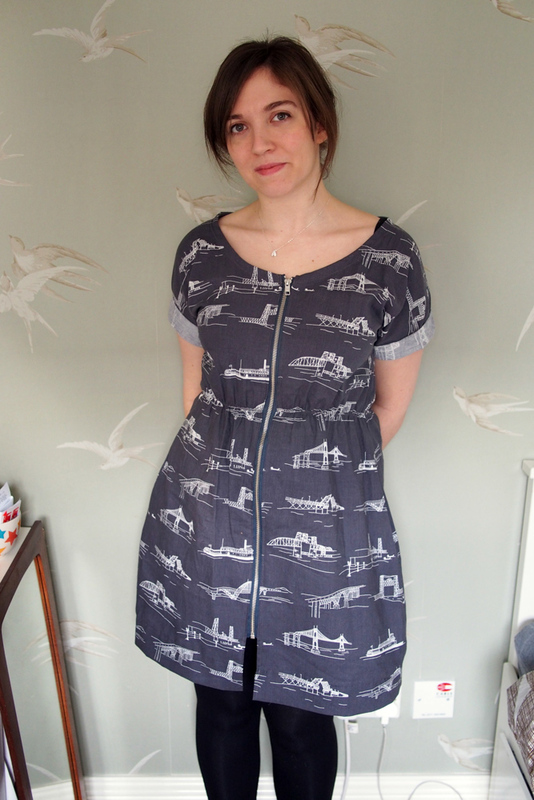 To that end, I’m rather pleased with this simple cotton dress that I made leisurely last weekend. It did end up presenting quite a challenge: not in the actual construction, but in designing it to fit into my everyday wardrobe without getting carried away with unwanted details. Challenge the first to surmount: shock horror, it isn’t made from my beloved jersey. I had a gift voucher for The Village Haberdashery and chose this ‘Waterfront Park’ quilting cotton as I love the colour and print. I wouldn’t usually make a frock from quilting cotton but this stuff is super nice, with quite a bit of cross-grain stretch and a good drape which makes it suitable for garments. It doesn’t even crease as badly as I was expecting during a day’s wear. 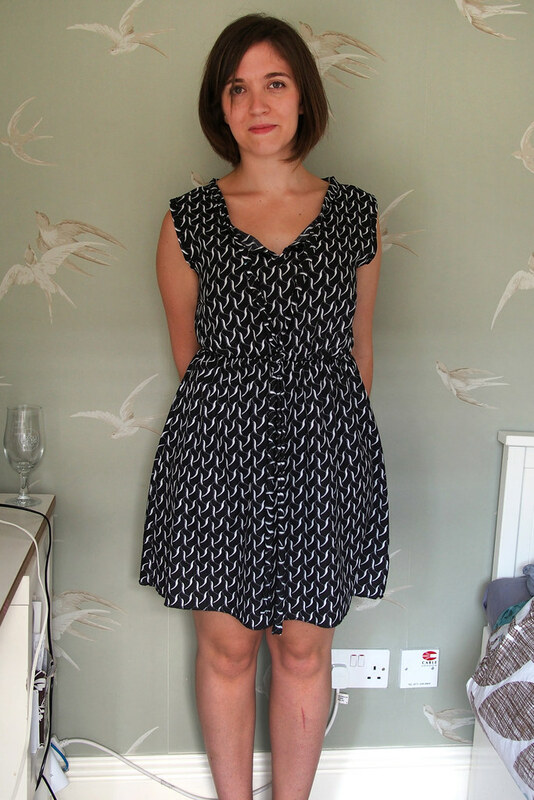 I learnt from my 2013 review that I do not wear non-stretch dresses on a regular basis, so how else to make this work for me? – choose an easy elastic-waist shape rather than try to do anything too structured and fitted, like the Belladone or Elisalex I first considered. 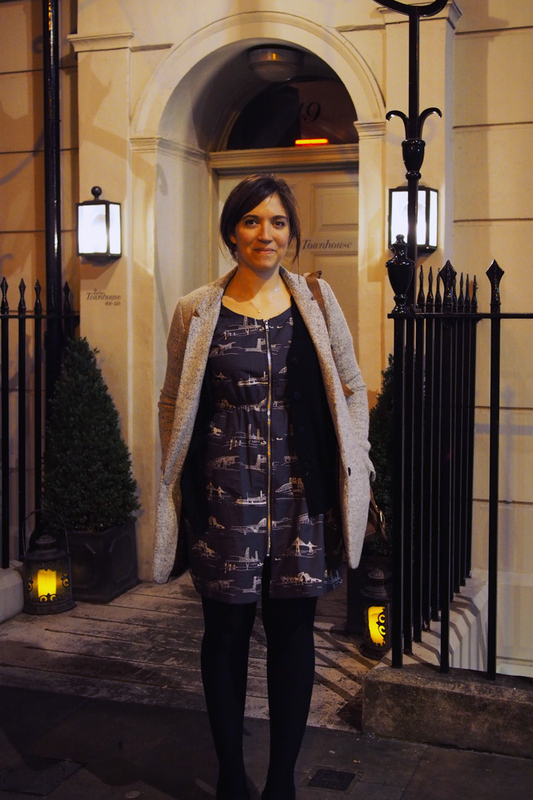 I used Salme Patterns’ Kimono dress as a basis, but altered it quite a lot. I cut the skirt and bodice together as single pieces (front and back) and omitted the facings, meaning the dress is just two pieces. 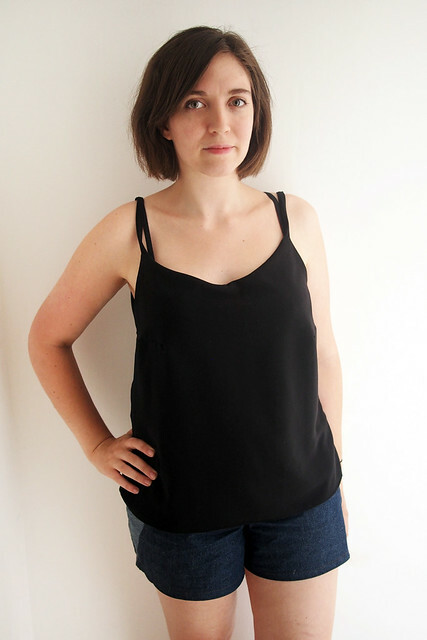 I cut more of a scoop neck (a bit too wide, bra straps tend to peek out), flared out the skirt by an extra inch or two at each side, shortened and rolled back the sleeves, and took it in at the armpit as it was looking a bit batwing. It isn’t really the same pattern at all after all that, ha. 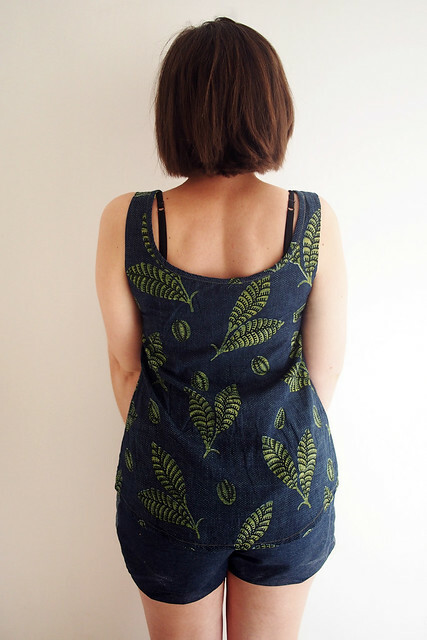 I was really set on keeping the design simple, simple, simple to make sure it stayed everyday-wearable, so resisted the urge to add any little details like pockets, collar or pleats that would tip it into fussy. I stuck to this until right to the end, when I was rooting through my sewing box for some bias binding to finish the neckline and came across the grey metal zip, unused from my biker coat. 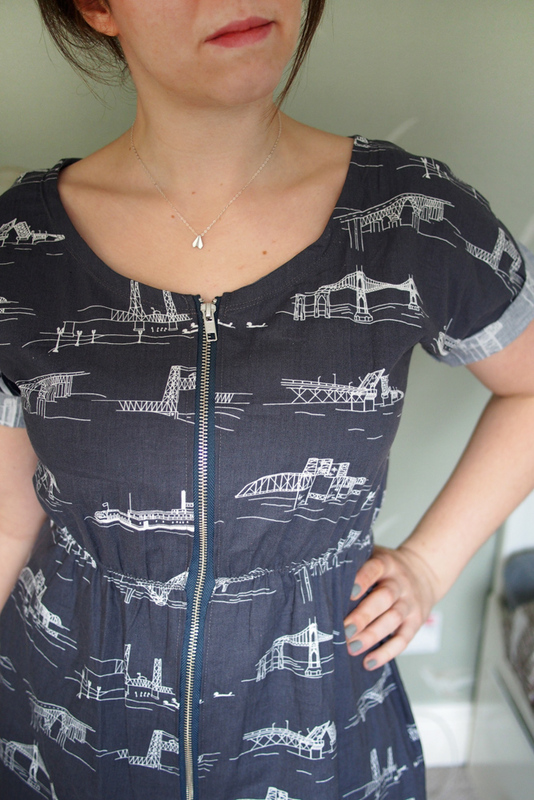 I can’t resist a chunky zip detail, so sliced my dress right up the front and sewed it in. The zip was a touch shorter than the length I wanted so it looks a bit weird that it ends above the hem, but I can deal with it. Otherwise I’m dead pleased with this dress and I think it will definitely be in regular rotation. I even wore it yesterday, my birthday, for drinks and dinner. 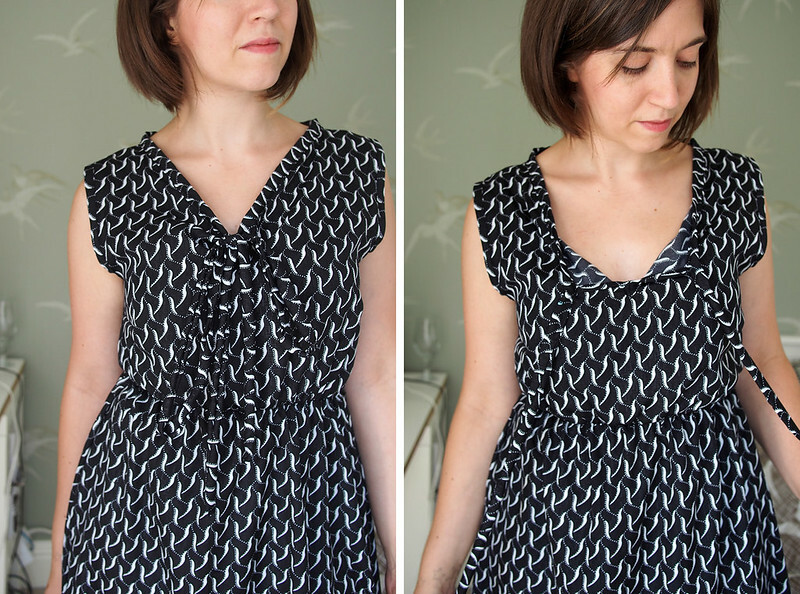 It’s just as easy to wear as a knit dress, so I’m going to look out for more sweet quilting cottons that could be used in a similar way. 1. Pockets. 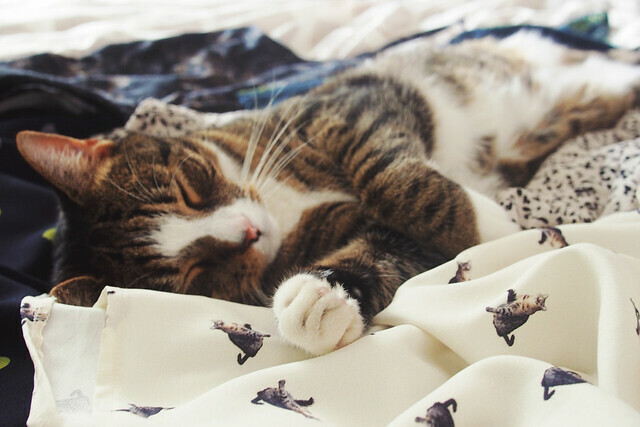 I keep reaching for them on this dress! I want to learn how to draft curved hip yoke pockets as I find them more interesting and flattering than side seam or patch ones. Then add them to everything. 2. Sleeves. Kimono sleeves are comfortable to wear but can look a tad sloppy, especially in more rigid fabrics. I would experiment with raglan or regular set-in sleeves. 3. Waistline. 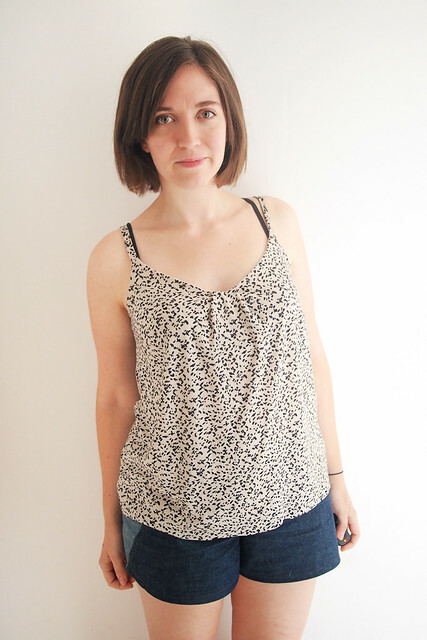 I like an elasticated waist, but they can also look a bit lazy and not drape well in stiffer cottons. Could try semi-elasticated (flat-fronted, elastic in back), smocked or drawstring instead. 4. Other details. A keyhole at the back neck? Chest pocket? Peter pan collar? Loads of scope for variations once the basic shape is sorted. Subtitled: a lesson in fabric choices. 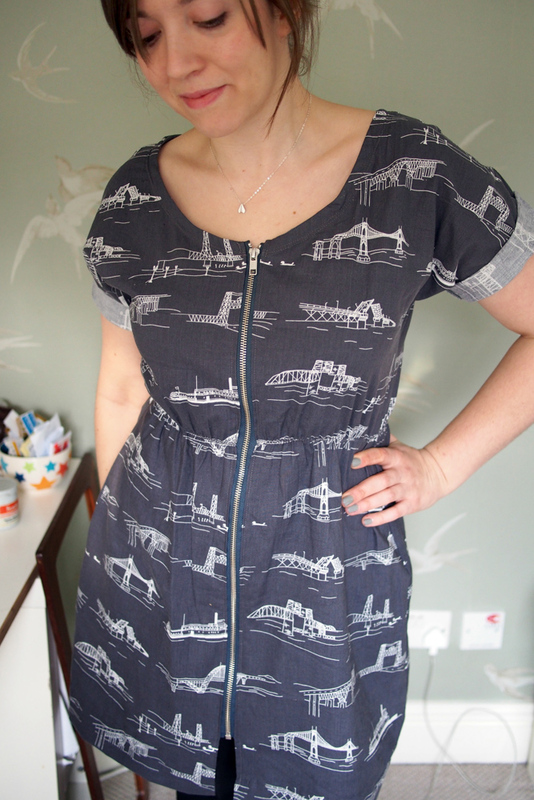 My first one is made from a lightweight mystery (polycotton I think) from Chapel Market – £3 in the remnants bin. Perhaps predictably, it was a nightmare to sew with because it frayed like a beeyatch. Sewing on the bias binding and creating the collar/tie piece without it unravelling before my eyes was painful. I wore it yesterday and the overlocked side seams started disintegrating! 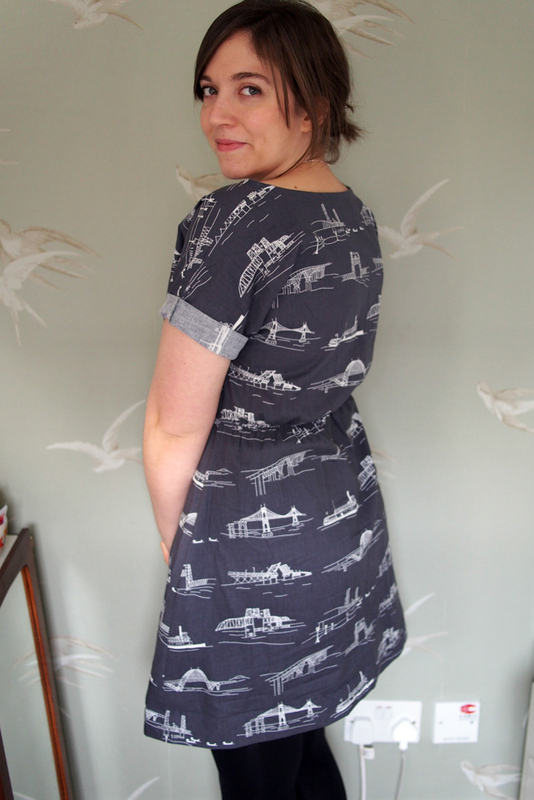 I really should have invested in a finer needle and/or French seamed the whole thing, but eh, I am an impatient sewist. That aside, the construction is a bit tricksy anyway. 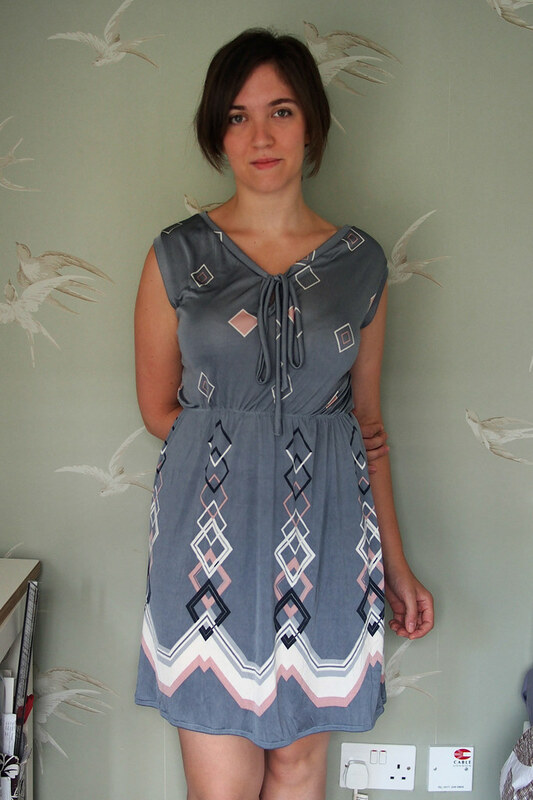 The neckline involves tedious pressing and topstitching to get the collar and ties on with no seams peeking out. Given that I was working with a poly that really didn’t want to retain its ironed-in fold lines, this was a pretty big ask. I ended up cutting a few versions of the ties and trying different techniques until I found one that just about worked and looked fairly neat. I went for longer skinnier ties to make the neckline lie a bit flatter and let me adjust the way it can be tied in the front – a waist-level knot or neckline bow. 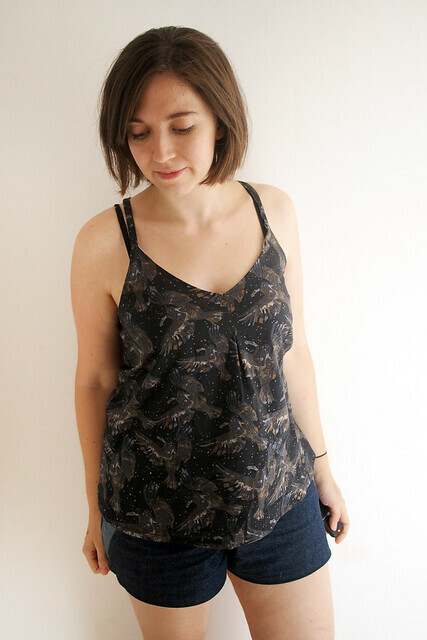 The second one is made of equally cheapo fabric – a border print ‘slinky jersey’ from Minerva – but, back in my beloved stretch fabric comfort zone, it went much more smoothly. 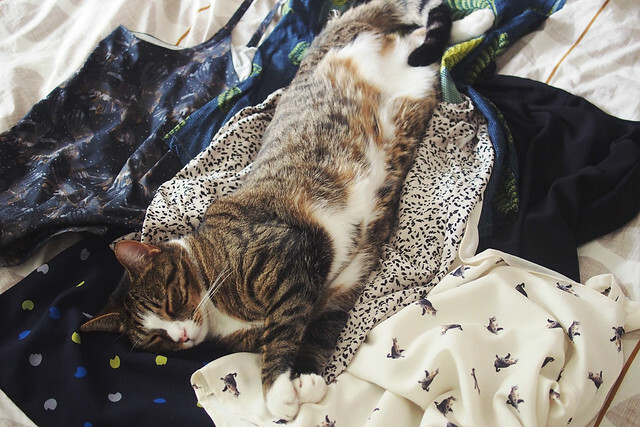 I honestly don’t get why people are so scared of sewing stretch fabrics – sooo much easier to fit, finish and seam! No need for any bias fiddling: I overlocked the armhole and neckline edging (cut on the cross-grain), turning inside-out when I hit the end of the neckline to form the ties. The join isn’t quite as neat as on the first dress, but if I tie the bow high you can’t see anything. 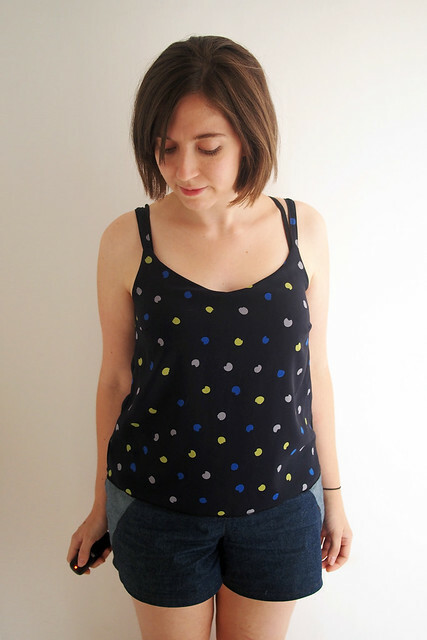 I entirely forgot to sew the bust darts into this one, hence the slightly odd pulling around the waistline. I took the effort to centre the pattern on the front and attempted to match it at the side seams. On this version I actually cut the entire front and back as continuous pieces (bodice and skirt connected) and added the elastic waist afterwards. On both dresses I shortened the bodice by about 4 inches to sit on my natural waist and took in the bottom of the armholes a little to avoid bra-peekage. 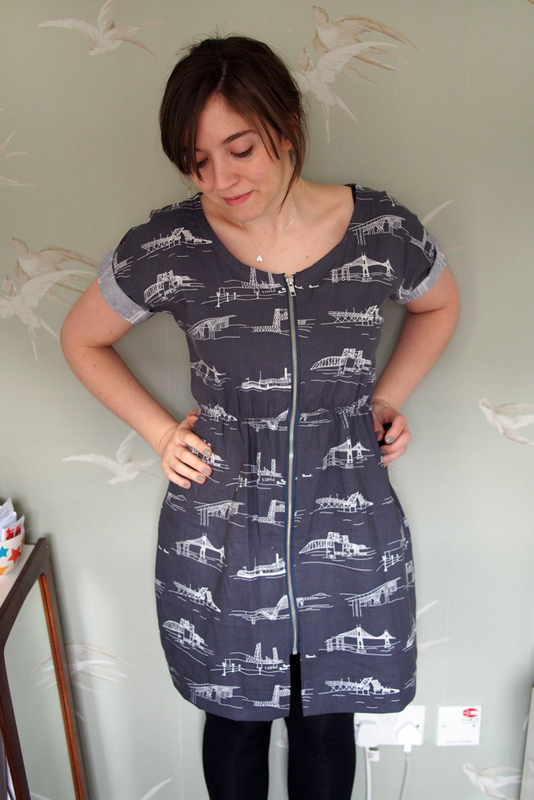 I really love the basic shape of this dress, so it’s a great little pattern to have in my collection.